I was craving chicken and waffles yesterday so I stopped off at IHOP and ate some, because that’s what you do when you’re an independent man that don’t need no meal times! Anyways I had a thought, “What if they made the waffles fries?” Waffle...fries...waffle..........fries. 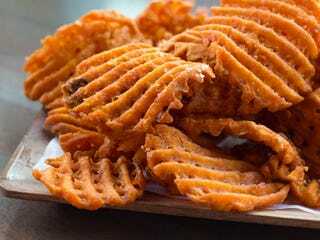 Waffle fries!! Oh my grits it’s so simple yet so brilliant! Then you could dip your waffles into the syrup or honey mustard or whatever you’re into. It allows for the meal to be eaten on the go! Drive thru-ability!! What do you think? !